Part of McGraw-Hill'sExplorations in World Historyseries, this brief and accessible volume explores one of the biggest questions of recent historical debate: how among all of Eurasia’s interconnected centers of power, it was Europe that came to dominate much of the world. 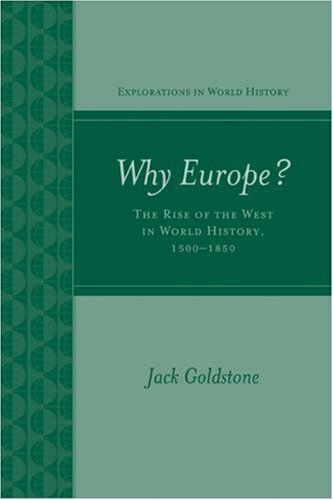 Author Jack Goldstone presents the argument as it stands in light of up-to-date research so that readers can come to understand the technological and economic inequalities between Europe and the rest of the world came to be and decide for themselves where the driving forces behind this phenomenon are taking us. Jack A. Goldstoneis the Hazel Professor of Public Policy at George Mason University and received his Ph.D. from Harvard University. He has won major prizes from the American Sociological Association and the Historical Society for his research on revolutions, population, and political conflict. His 2010 essay in Foreign Affairs, The New Population Bomb has received world-wide attention. A Phi Beta Kappa visiting lecturer, Goldstone has authored or edited ten books and published over one hundred articles in books and scholarly journals. His latest books are Why Europe? The Rise of the West 1500ndash;1850(2008) and Understanding Revolutions(forthcoming). Changing the Pace of Change: Was there an Industrial Revolution? Conclusion: The Rise of the West: A Temporary Phase?